FORT WORTH, Texas _ Mired in a career-worst slump, Jimmie Johnson _ Who else?_ paced Saturday afternoon’s weather-delayed Monster Energy NASCAR Cup Series final practice for the 22nd annual O’Reilly Auto Parts 500 at Texas Motor Speedway. The defending event champion, Johnson ran only three laps around TMS’ 1.5-mile oval during the 40-minute session but wound up atop the chart at 27.253-seconds/198.143 mph. Johnson, driver of the No. 48 Chevrolet Camaro ZL1, was the only driver to crack the 198 mph mark. Johnson’s current 29-race winless streak is the longest of a career marked by a record-tying seven Cup championships. TMS could offer the Hendrick Motorsports star a quick return-to-form. 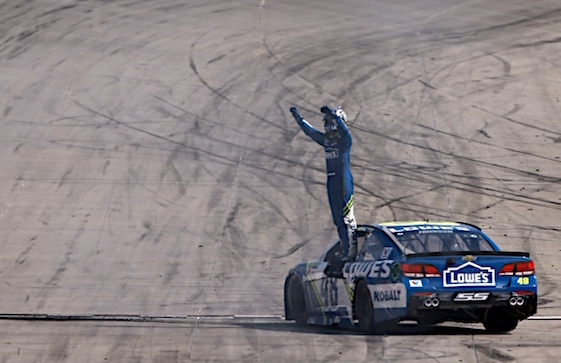 Johnson is a seven-time winner at TMS, most of any Cup driver. In 29 starts he has 15 top-five and 21 top-10 finishes. He has finished second five times. He’s also the all-time leader in laps-led (1,041) and boasts a top-10 career average in both finish (8.8) and starting position (9.4). And, in the spirit of instant karma, TMS management is giving out Jimmie Johnson bobblehead dolls Sunday to the first 30,000 fans. Saturday morning’s opening 55-minute practice in 35-degree weather more suited to hockey saw Daniel Suarez and the top-12 drivers post laps faster than Kurt Busch’s pole-winning speed of 197.368 mph set late Friday afternoon. Johnson was fourth in that session at 198.639 mph. Kevin Harvick, a three-time race-winner this season, was second-fast at 27.275-seconds/197.984 mph in the No. 4 Ford Fusion fielded by Stewart-Haas Racing. Suarez, the series’ first Mexican-born driver, added to the manufacturer mix in third with a best lap of 27.303-seconds/197.780 mph in the No. 19 Toyota Camry fielded by Joe Gibbs Racing. Pole-winner Busch improved from 12th in the morning to fourth in the final at 197.759 mph in the No. 41 Ford fielded by SHR. Reigning series champion Martin Truex Jr. rounded out the top-five at 197.614 mph in the No. 78 Toyota fielded by Furniture Row Racing. Clint Bowyer, who broke a 190-race winless streak two weeks ago at Martinsville Speedway, was ninth after lapping at 197.527 mph in the No. 14 Mobil 1/Rush Truck Centers Ford. Ricky Stenhouse Jr., who damaged his primary car in the morning session, hot-lapped in his backup No. 17 Ford at 194.967 mph. Stenhouse turned six laps in his Roush Fenway Racing entry. Stenhouse scraped the Turn 4 wall at approximately 10:35 a.m. in his primary ride, resulting in heavy right-side damage. Sunday’s race, scheduled for 334 laps/501-miles, will be televised by FOX Sports 1 at 1 p.m. (CDT).